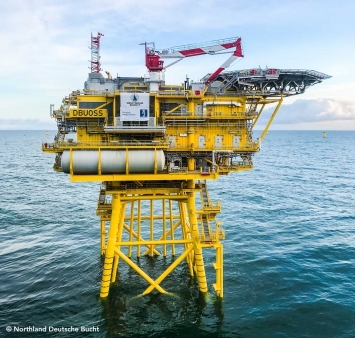 On Tuesday 2 April 2019, the offshore substation of 269 MW Northland Power’s Deutsche Bucht offshore wind farm was successfully installed. The substation with a 2,700-tonnes topside is the centrepiece of the wind farm. It houses all electrical equipment needed to transform the power from the 33 turbines to a higher voltage for further transmission. Both the jacket foundation and the topside platform were built by Smulders at the Smulders and Damen yard in Vlissingen, the Netherlands. Two transport barges towed the jacket and the topside to the construction site, located about 100 kilometres from the mainland in Germany’s Economic Exclusive Zone. After the 61- metre -high jacket was installed on the seabed, the 19 -metre -high topside was lifted and mounted on top of it. The top deck of the offshore substation reaches to approximately 40 metres above the sea level. A helicopter landing platform allows access to the platform for operation and maintenance work. The joint-venture Smulders-Eiffage was contracted by Van Oord for the engineering, procurement, construction and installation of the Deutsche Bucht topside and jacket. Van Oord is the Balance of Plant contractor for the Deutsche Bucht project. The Deutsche Bucht offshore wind farm, owned by Northland Power, will be an impressive wind farm with 33 turbines, situated 95 kilometres northwest of Germany’s Borkum Island. The wind farm will have a total capacity of 269 megawatts, which will be sufficient to power approximately 328,000 households per year.